As they're oft to do, another refugee from the underground fight scene will soon be making the transition to "above the board" event. I'm talking about none other than Rashad Clarke, who's been a staple in the Underground Combat League for years, and who will step into the cage on Saturday night at Aggressive Combat Championship to face Eric Taylor. In the spirit of getting to know New York City's MMA fighters better, The MMA Journalist shot Clarke a few questions; here are his answers. Talk about your training background - how long you been training, with who, etc.? I been training in boxing since 2007. My first time fighting MMA was 2009. From there I trained with various gyms and coaches I could find. Why did you get into fighting? 'Cause I was good at it and I always looked at the next fight as a challenge that I had to overcome. I always enjoyed a new challenge. 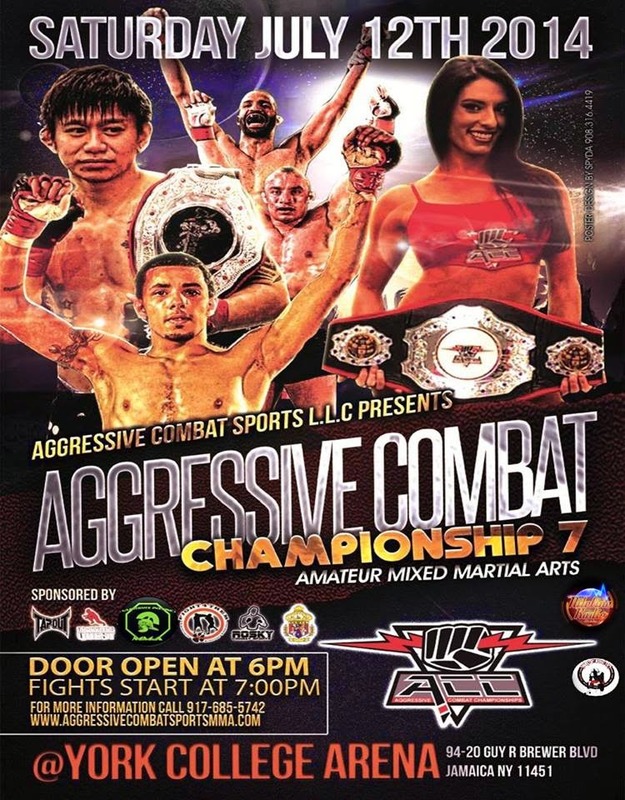 You're fighting this Saturday at the Aggressive Combat Championship - what do you expect out of your opponent? I expect him to come in the ring and try to take my head off - LOL. I always go in thinking my opponent got it so I can go harder. You've fought primarily in the UCL. Is it going to be weird fighting in a bigger show with 500+ people in the audience? No, not really. This is a spectator sport, I always come in expecting a full audience. 500+ people just tells me I'm moving up to bigger and better shows. What do you want to accomplish in MMA? I got two little girls that I want to give the world, so I'm gonna keep knocking them down until I reach there - and I would love a PPV event so people can watch me on their TVs and say "I know him!" LOL. But I wouldn't mind getting put on a UFC card. LOL. Bonus: A video of Rashad Clarke's last fight.